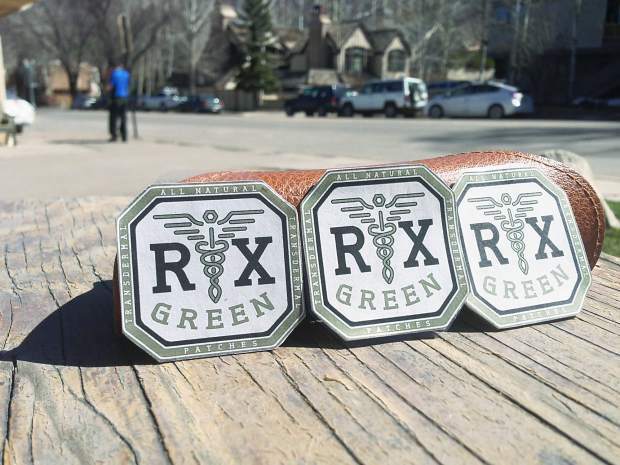 RX Green, the maker of cannabis-infused patches, cranked up operations this week in a space underneath the old Johnny McGuire's Deli location in Aspen. Ganjaprenuer Josh Meacham can finally say he’s found a sweet spot to make his pot patches. Meacham began production this week of the cannabis-infused patches at his lablike facility below the now-defunct Johnny McGuire’s Deli at 730 E. Cooper Ave.
RX Green is the name of the startup company with just a handful of employees. And it’s been awhile in the making. At one time, Meacham had planned to manufacture the patches at the old Poppies Bistro Cafe building at 834 W. Hallam St., but that deal fell through, leading him to find a spot in the Buckhorn Arms building. Meacham said he began researching the idea two years ago. His goal was to make patches that can provide comfort to the sincerely sick — those with Alzheimer’s, cancer, epilepsy and other ailments. He obtained licenses to make both recreational and medical patches. For medical patients, the benefit of the patches is they don’t have to inhale or eat anything. By placing a patch on their arm, the effects take hold in about 30 to 45 minutes and last as long as 10 to 12 hours, Meacham said. As a distributor, RX Green won’t be sold on site, but instead to cannabis clinics throughout the state, including the six in Aspen, Meacham said. On Friday, he took a reporter on a nickel tour of the roughly 600-square-foot space where the patches are made. It’s a three-step process with three machines, starting with a CO2 extractor. “The machine breaks down the oil and it extracts it, and it’s super critical to the process,” Meacham said. The process takes about six to eight hours. The machine, which Meacham said “cost a pretty penny,” was originally used for making decaffeinated coffee. The second step is “where all the work begins,” Meacham explained. The machine basically breaks down the oil, activating its CBD and THC ingredients. CBD is the ingredient that counters the THC’s psychoactive effects and the chief cannaboid used for medical applications. Then comes the patch work, made on a third machine. The machine’s settings can call for a 20- or 30-milligram patch, for instance, which can be used for medical purposes, or as low as a 10-milligram patch, the state’s maximum amount for an individual dose for recreational use. “It allows us to ensure that every patch is the same size,” Meacham said. Making a patch takes about one day, Meacham said. The facility has the potential to make up to 15,000 patches daily. The transdermal patches come in different types — THC sativa, THC indica, THC hybrid, THC-CBD. “We’ll soon outgrow this place,” Meacham said. And it also appears to be a matter of time before the Buckhorn Arms building is razed and replaced with a hotel. Developer Mark Hunt has received city approval to build an affordable — by Aspen standards — 44-bedroom hotel at the spot. “We’ve worked out an agreement where we’ll be here less than a year,” Meacham said. Meacham said all of the ingredients are organic, taking out the guesswork for those users concerned about what they’re putting in their bodies. “It’s 100 percent all natural,” he said, noting that his company uses cannabis from a Roaring Fork Valley farm whose name he wouldn’t disclose. As the legalization and decriminalization of cannabis continues to spread, Meacham said he has designs to sell the patches in other such states as Arizona, Oregon and Washington when the time is right.